OK, so this was my first proper MTB and had the life ridden out of it right up to the point where I nearly got the life ridden out of me following a high speed road crash... at which point the faithful frame got stuffed up the roof and a shiney Zaskar picked up from my LBS... that was '96. Please note that this is very much a work in progress, so don't expect too much... yet... This is a 'potter along and enjoy it' build, whereas my Zaskar was a 'I need to ride again' build. Anyway. So, first off, here's what she was like back in the day. Note the original (horrible) suspension forks that had about an inch of travel and snapped under the crown (both legs together) while riding, about six months after buying the thing new. Hence the later shots have Mag 21s, that eventually migrated to my Zaskar (in fact, if you check the pics on the Zaskar thread you'll see that the large majority of the parts migrated frames). Also going to stay with Onza HO up front and cantis on the back, for two reasons: 1) that's what I used to ride it like (could never afford the full set) and 2) I've heard 'orrible stories about HOs cracking under heavy braking and fancy a reliable set of stoppers on at least one end of the bike. By the way... I know a lot of these are race pictures... but I was never actually any good. Just the only time anyone was around to take pictures of me. (Oh and not ridden it yet (obviously... doh...) - hence brake levers, etc, are at weird angles. Nice. Looks similar to my kili. Thanks. Helps with my fading memory although fairly mine sure came with the Ritchey saddle on it now rather than that fancy flite wannabe. Think I used to have a catalgoue just like that somewhere but no-idea where it is now - was good to see it again, so thanks. 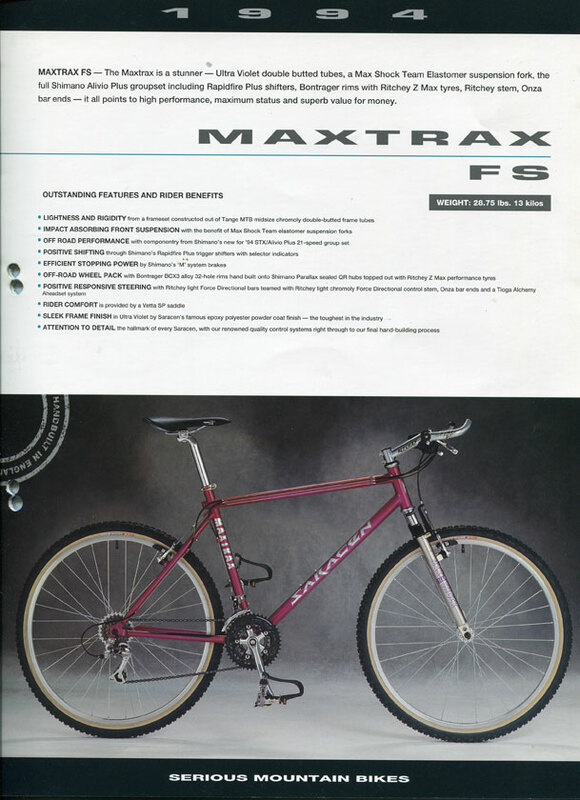 Always loved this era Saracen purple though - one of the main reasons I bought the bike BITD.